We have already seen Wolfram helping out solve complex maths integration problems. Wolfram is also doing music based on calculations resulting in cool sounding ringtones. You can togggle to listen random ringtones and download them as mini via email or get them delivered to your mobile phone. To get started, you can pick category of music that interests you. It has loads of options including: jazz, country, latin, classical dance, hip hop, blues, r&b, guitar and many more. Say you want tones from guitar category, just keep clicking guitar button and hear tones at random. You can click the download button to grab the tone that sounds best. 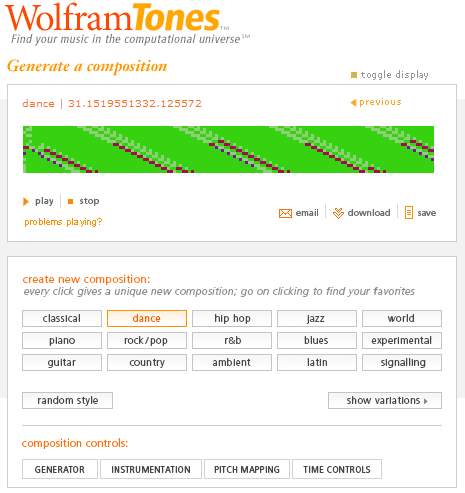 Get musical on Wolfram Tones to generate and download random ringtones for pure audio pleasure.